West Bromwich Albion came away with a point as Bryan Robson's side moved four points clear of the relegation zone. Each side hit the woodwork, with Thomas Myhre pushing Geoff Horsfield's header on to the upright in the first half. 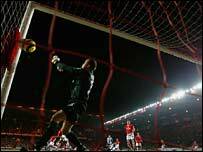 Late in the second half West Brom goalkeeeper Tomasz Kuszczak deflected a Luke Young cross on to the post. Both keepers enjoyed fine games, with Myhre doing well to keep out a Jonathan Greening shot, while Kuszczak tipped away a goal-bound Bryan Hughes shot. The match had a quiet opening but the first-half's final 15 minutes saw both sides go close as the match swung from one end to the other. Greening drew an excellent save from Myhre with a dipping long-range shot. Myhre's save prompted a more concerted attacking approach from Charlton. Darren Bent's physical strength saw him get the better of three West Brom defenders only for the Charlton striker to put his shot wide of the post. More uncertain West Brom defending - this time from Curtis Davies - provided Darren Bent with another shooting chance, which was well saved by Kuszczak. A surging run from Alexei Smertin then opened up the West Brom defence but the Russian's shot fizzed wide. Having survived those scares, Charlton experienced their own defensive frights as Horsfield twice went close. The West Brom striker ghosted in at the far post to meet Greening's wonderful cross but Myhre somehow managed to keep Horsfield's header out by pushing the ball on to the post. Just before the interval Andy Johnson's persistence allowed Horsfield to pick up the ball on the edge of the box and after some deft footwork the West Brom striker shot narrowly wide. Charlton came to the fore after the restart and Kuszczak had to throw himself across his goal to palm away Hughes' curling shot. Davies, who had had an uncertain first half, came up with an important tackle to prevent Darren Ambrose getting in a shot. The West Brom defender produced an even better block to frustrate Darren Bent. Charlton's other striker Marcus Bent claimed he should have had a penalty when he went down under pressure from Paul Robinson but referee Peter Walton waved play on. Charlton manager Alan Curbishley: "We had the better of the half-chances, especially the ones that felt to Darren Bent. "It was a tough old game for us. West Brom came out of the blocks and looked sharp early on and we had to work our way back into the match. "Marcus Bent has taken a knock but I'm hoping he can form a partnership with Darren Bent." "If they keep performing like that I'm confident we will stay up. "We are down to the bare minimum with injuries, suspensions and the players away at the African Cup of Nations. "We're in a reasonable position - this was a good battling performance by the team." Charlton: Myhre, Young, Fortune, Hreidarsson, Powell, Hughes, Holland (Kishishev 43), Smertin, Ambrose (Thomas 72), Darren Bent, Marcus Bent (Bothroyd 83). Subs Not Used: Andersen, Spector. West Brom: Kuszczak, Albrechtsen, Curtis Davies, Clement, Robinson, Greening, Inamoto, Johnson, Carter, Campbell (Ellington 55), Horsfield. Subs Not Used: Kirkland, Chaplow, Kozak, Nicholson.